TLV has won a contract to provide regular steam-trap surveys of all 13 BOCM Pauls animal-feed processing sites throughout the UK, using its latest Trapman® TM5 testing equipment. BOCM Pauls has 13 sites in the UK producing animal feed for all types of livestock, including dairy and beef cattle, sheep, pigs and poultry. The sites located on the west side of the country, where rich dairy grass is more common, are predominantly dedicated to ruminant feed, while those on the east side are dedicated to pig and poultry feed. The majority of the steam generated by the plants is used for direct steam injection, which sterilises the meal to eliminate salmonella and conditions it with moisture to help begin the cooking process before it is extruded and pelletised. Steam is also used to maintain the required temperature in storage tanks, which pre-heat liquids that are added to the meal during the cooking process. As the BOCM sites are regulated by the Environment Agency, their Environmental Steering Group successfully gained accreditation under the ISO 14001 Environmental Standard, which provides a framework for the development of an environmental management system and a supporting audit programme. As part of the system, each site needed to monitor energy usage in order to improve efficiency and to reduce energy usage. Environmental Steering Group member Graham Reith, BOCM Pauls' Carmarthen site manager, said: 'While electricity is used to run the processing machines, with each mill typically using 1.5mW, the meal is sterilised and preconditioned using steam. 'The moisture in steam also acts as a lubricant while the meal is extruded through the pellet die, helping to reduce the energy needed to run the extruders,' he added. Reith was aware that some of the steam traps on his site were passing, but without sophisticated equipment it was not possible to identify which ones were faulty. With steam playing such a vital role in processing, he decided to ask TLV to carry out a steam survey at the site. 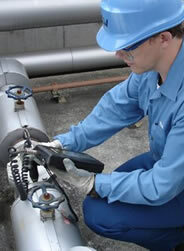 The survey was conducted using TLV's latest Trapman® TM5 testing equipment. Trapman® not only determines whether a trap is working correctly but also quantifies the steam losses in traps that are leaking. As a result of the survey, TLV was able to put costs against the volume of steam lost through faulty or leaking traps. The figures showed that there was potential for significant energy loss and led Reith to highlight the problem at the next steering-group meeting. Committee members realised that figures from the Carmarthen site could be replicated at the other 12 sites, so Reith's suggestion that the company undertake a survey of all sites was accepted and he was given responsibility for managing the initiative and reporting back to the Environmental Steering Group. While it was difficult to quantify results at all sites, a combination of the figures produced by TLV and substantiation from site managers and engineers confirms that BOCM is making considerable savings. Actual savings vary depending on the meal produced at the sites, as ruminant meal is typically conditioned at around 60C whereas the temperatures for pig and poultry meal will vary between 80C and 90C. Aside providing information on the condition and performance of steam traps, the TLV Trapman survey also identified all the steam traps at all 13 sites, allocated each a specific number and tagged them. By attaching coloured discs indicating whether a trap was leaking (red disc) or not working (blue disc), the survey has made it easier for the maintenance team to find faulty traps that are noted in the survey reports as needing attention. The total number of traps tested across all BOCM sites was 552, of which 89 (16 per cent) were found to be leaking. The TLV survey estimates the financial cost of the leaks at GBP95,000 and the environmental cost at 435 tonnes of CO2. According to Reith, the TLV survey has prompted a programme to address leaks across all sites. He added that managers at the sites that had experienced a higher percentage of failed traps had already reported reductions in steam wastage and energy costs. 'The financial and environmental costs have certainly encouraged the committee to continue surveying the 552 traps at six-month intervals,' said Reith. 'From a bio-security viewpoint, steam is an effective way to produce pellets and for BOCM Pauls it is now proving to be an efficient way to reduce energy consumption, which is very good news,' added Mike Povey, general manager of TLV.